We want you to feel free to ask question, share concerns, provide us with tips, videos and anything else that can make archery affordable and fun.. If you have pictures of you shooting your bow or videos and are willing to share them with others please send them. 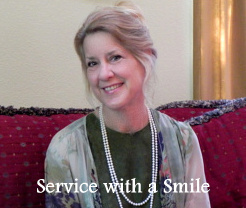 You will always receive customer service with a smile. You might not see the smile but it will always be there..
BWl Bows and Arrows wants to provide a friendly atmosphere for you to visit, buy archery equipment and learn more about archery in general. BW Bows and Bob and Mary Wilkerson are commited to providing the best products, the best customer service and best online experience you can find on the internet. please keep coming back to find out what we have added. If you take any pictures of you shooting your bow please send them to us to post on this site with your permission. Ways to Contact Us. Don't Hesitate to Contact Us. Hours of Operation - 8:00AM - 7:00PM PST - 7 Days a Week. 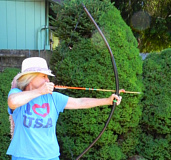 Making Archery Fun and Affordable one person at a time..
What good is life unless you have a little fun along the way. Shooting a bow and arrow can be fun and affordable with BW Bows and Arrows..
Take a look at our kids bows. If you are on the site to receive instructions about the bow you purchased please notice the navigation links at the top, side and bottom of the page. To determine which link you need for your bow just look on the invoice to see if you have a Take Down , Full Length or a Light Bow. After determing which one you have click on the link for instructions and a few videos. Copyright � 2010. All rights reserved. Creative Exploits.